Deployment is the process of distributing the files that make up an application to install it on the target computers. Here we will be learning the deployment using the Visual Studio .NET Deployment tools. Before the practical demo I must tell you the various project editors that used in for the deployment. Add a special Folder--Select the "File system on Target machine" node, and then select appropriate folder form Action->add special folder menu. Delete a folder-Select the folder and press del key. Or select Edit->Delete. Select your project from the dropdown list. You can select one or multiple output types from the box, the description of the selected output is displayed in the description text box. If you wish to delete the output types you can do that by selecting the project output, and select edit-> delete. Adding/Removing shortcuts--Select the file/folder to which a shortcut is to be created. Select Action->create shortcut to <name>. assign a name. You can change the shortcut location by moving it to appropriate folder in the File System editor. You can perform a cut-and-paste operation to move the shortcut to the appropriate folder by using the edit menu. Add/Remove registry keys--Select one of the top-level key nodes. Select Action->New key. And specify its name. If you want to add a subkey within an existing, perform the following steps--Select a key. Select Action->New->key. Adding/Removing Registry key values--Select the key in the registry editor. You can assign four types of values to registry keys: binary, string, environment string, and DWORD. Depending on the type, select the appropriate option from the New option on the Action menu. The newly created value appears in the Name column of the detail pane of the Registry editor. Type a name for the new value. In the properties window, select the value property and type a value. Importing an existing registry file in the registry editor--Select the registry on Target machine node. Select Action->Import. Locate your .reg file and click open. You can perform following functions using files types editor. Add/Remove file types-- Select "file types on target machine" node. Select action->add file type. To associate extensions with the file type, select the newly created file type. Press F4 to open properties window, select extensions property and specify the extension. You must use dot (.) when specifying. To associate the file type with an executable file, select the command property in the properties windows. This opens the Select Item in project dialog box. Select the executable file to be associated with the file type. You can also associate an icon with a file type. For this select the icon property and specify the file to be associated with the file type. Start: Displayed before installation begins. End: After the installation is complete. E.g. like the ones to inform success or failure of installation. Now select any dialog box according to your requirement. And click ok. You can change the sequence of dialog box to appear by clicking move-up, or move down from the Action menu. You can use the installer to perform some additional custom tasks like to create a database during installation. To perform the function of adding a custom action--Select the section in which the custom action is to be added. Select Action->Add custom action. This invokes the select item in project dialog box. Select the .dll or .exe file. Internet Information Services Launch Condition: determines whether IIS is installed. 2. In the project panes, select Setup and deployment projects. In the templates pane, select setup project. 3. Change the name to "samplesetup", as my demo is creating a setup for a sample project. Click ok.
4.Select File->Add project->Existing Project. And add your project, in my case it is "sample". 5. 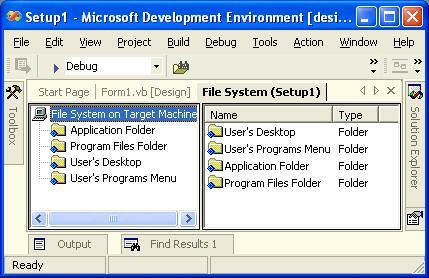 Select the "File System on Target Machine" in the File system editor. 6. Select Action->Add Special Folder->Program Files folder. 7. Select the program files folder node. Select Action->Add->folder. Type the name of the folder as "samplesetup". 8. To add the output, select Action->add->project output. Select "sample" from the drop down-list. Select primary output from the output list. 10. To create a shortcut on the desktop, in the details pane select primary output from sample. select action->create shortcut to primary output. Change the shortcut name. Drag the shortcut to the user's Desktop node in the left pane. 11. To add a Dialog box--open your word pad, type your license agreement and save it as License.rtf i.e in Rich Text Format (RTF). 14. To execute the windows installer package which we had just created, open windows explorer. Locate the setup.exe and double click it. Verify that your License agreement appears. And you get a shortcut on the desktop. Now you are ready to run your application form the deskstop icon. My desktop icon that appeared after installation. You need to know that every .Net application or .Net custom control can be easily decompiled by using one of the many free .Net decompilers. Practically, if your user have an access to your exe or dll files, he or she also have an access to your source code. That is a problem if you sell the software and your license don't include source code. To protect all our applications and controls, Bean Software uses Spices.Net. Even if you can't afford complete suite, you should get at least their Obfuscator. This tutorial is written by pinkdamselblack.